The hate is palpable. We officially have a series. 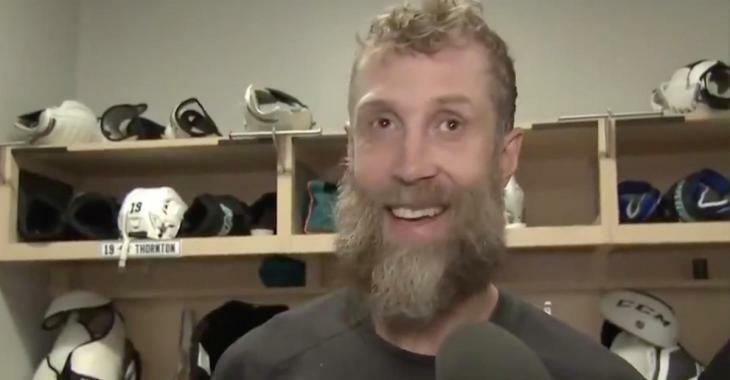 In case you missed it, San Jose Sharks forward Joe Thornton will be granted a hearing today with NHL Player Safety for his headshot on Vegas Golden Knights forward Tomas Nosek in last night’s game. That’s… that’s ugly. Nosek is defenceless, doesn’t see the hit coming and Thornton drives his shoulder right through Nosek’s head. Jumbo is likely to sit in the press box for at least a game. Thornton tries his best to play dumb in the situation, but he’s too smart and too good of a player to not know what he’s doing. After the game, Thornton brushed off the hit saying he didn’t think there was anything particularly wrong it it. C’mon Jumbo… you can’t be serious? Then again… he is getting older, maybe his eyes are failing him? Well… that’s Ryan Reaves’ theory at least. Wow… throwing down the gauntlet by calling out Jumbo for his age? To be honest, I’m not sure that’s much of an insult. As much as a fan favourite as Reavo is, he’ll be extremely fortunate to be playing in the NHL at Thorton’s age. In any case, who doesn’t love some playoff trash talk!? Keep it comin, Reavo. Interestingly enough, Thornton also had some words for Reaves. Jumbo chimed in on Reaves’ last minute scrap with Evander Kane with his tongue placed firmly in his cheek. We officially have a series, hockey fans.